A collectors item from the anti-colonial struggles of the seventies. 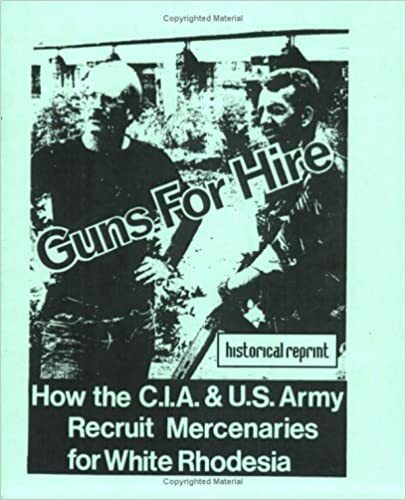 This text details how the US military and CIA colluded with Solider of Fortune magazine and others to send white mercenaries to fight for the Ian Smith regime in Rhodesia. While the nitty gritty details are mainly of historical significance, given the heavy reliance on "contractors" in Iraq and elsewhere, the broad outlines of this work remain relevant today. Originally published in the 1970s, ths new introduction has an introduction written in 2005. From the introduction by Jon Dough: "Although the CIA's mercenary operation for Zimbabwe had failed in the end, the machinery remains as a covert weapon that can be restarted and put to use in new imperialist interventions and wars in the Global South. That's why this investigative report still has useful knowledge for everyone tracking the bloody footprints of the u.s. empire."